Tag words: carbon cycle, primary production, nitrogen cycle, sulfur cycle, biodgradation, methanogen, methanogenesis, nitrogen fixation, denitrification, nitrification, anoxygenic photosynthesis, anaerobic respiration, lithotroph, lithotrophy. Carbon is the backbone of all organic molecules and is the most prevalent element in cellular (organic) material. In its most oxidized form, CO2, it can be viewed as an "inorganic" molecule (no C - H bond). Autotrophs, which include plants, algae, photosynthetic bacteria, lithotrophs, and methanogens, use CO2 as a sole source of carbon for growth, which reduces the molecule to organic cell material (CH2O). Heterotrophs require organic carbon for growth, and ultimately convert it back to CO2. Thus, a relationship between autotrophs and heterotrophs is established wherein autotrophs fix carbon needed by heterotrophs, and heterotrophs produce CO2 used by the autotrophs. Since CO2 is the most prevalent greenhouse gas in the atmosphere, it isn't good if these two equations to get out of balance (i.e. heterotrophy predominating over autotrophy, as when rain forests are destroyed and replaced with cattle). Autotrophs are referred to as primary producers at the "bottom of the food chain" because they convert carbon to a form required by heterotrophs. Among procaryotes, the cyanobacteria, the lithotrophs and the methanogens are a formidable biomass of autotrophs that account for a corresponding amount of CO2 fixation in the global carbon cycle. The lithotrophic bacteria and archaea that oxidize reduced N and S compounds and play important roles in the natural cycles of N and S (discussed below), are virtually all autotrophs. The prevalence of these organisms in sulfur-rich environments (marine sediments, thermal vents, hot springs, endosymbionts, etc. may indicate an unappreciated role of these procaryotes as primary producers of organic carbon on earth. The methanogens play a dual role in the carbon cycle. These archaea are inhabitants of virtually all anaerobic environments in nature where CO2 and H2 (hydrogen gas) occur. They use CO2 in their metabolism in two distinct ways. About 5 percent of CO2 taken up is reduced to cell material during autotrophic growth; the remaining 95 percent is reduced to CH4 (methane gas) during a unique process of generating cellular energy. Hence, methane accumulates in rocks as fossil fuel ("natural gas"), in the rumen of cows and guts of termites, in sediments, swamps, landfills and sewage digesters. Since CH4 is the second-most prevalent of the greenhouse gases, it is best to discourage processes that lead to its accumulation in the atmosphere. Under aerobic conditions, methane and its derivatives (methanol, formaldehyde, etc.) can be oxidized as energy sources by bacteria called methylotrophs. 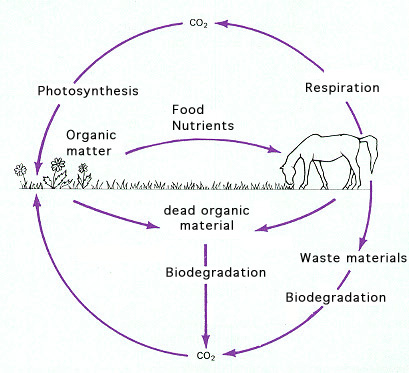 Metabolically this is a version of decomposition or biodegradation during the carbon cycle which is discussed below. Biodegradation is the process in the carbon cycle for which microbes get most credit (or blame). Biodegradation is the decomposition of organic material (CH2O) back to CO2 + H2O and H2. In soil habitats, the fungi play a significant role in biodegradation, but the procaryotes are equally important. The typical decomposition scenario involves the initial degradation of biopolymers (cellulose, lignin, proteins, polysaccharides) by extracellular enzymes, followed by oxidation (fermentation or respiration) of the monomeric subunits. The ultimate end products are CO2, H2O and H2, perhaps some NH3 (ammonia) and sulfide (H2S), depending on how one views the overall process. These products are scarfed up by lithotrophs and autotrophs for recycling. Procaryotes which play an important role in biodegradation in nature include the actinomycetes, clostridia, bacilli, arthrobacters and pseudomonads. The importance of microbes in biodegradation is embodied in the adage that "there is no known natural compound that cannot be degraded by some microorganism." The proof of the adage is that we aren't up to our ears in whatever it is that couldn't be degraded in the last 3.5 billion years. Actually, we are up to our ears in cellulose and lignin, which is better than concrete, and some places are getting up to their ears in teflon, plastic, styrofoam, insecticides, pesticides and poisons that are degraded slowly by microbes, or not at all. Figure 1. The Carbon Cycle. Organic matter (CH2O) derived from photosynthesis (plants, algae and cyanobacteria) provides nutrition for heterotrophs (e.g. animals and associated bacteria), which convert it back to CO2. Organic wastes, as well as dead organic matter in the soil and water, are ultimately broken down to CO2 by microbial processes of biodegradation. The figure above mostly ignores the role of methanogenesis in the carbon cycle. Since methanogens have the potential to remove CO2 from the atmosphere, converting it to cell material and CH4, these procaryotes not only influence the carbon cycle, but their metabolism also affects the concentration of major greenhouse gases in earth's atmosphere. Recently, I asked a colleague, Professor Paul Weimer of the University of Wisconsin Department of Bacteriology, whether mathanogenesis, which utilizes CO2 while producing CH4 was better or worse on the greenhouse effect and global warming. This is his response. "Worse. During methanogenesis involving CO2 reduction, the stoichiometry is 4H2 + CO2 --> CH4 + 2 H2O, so one mole of a greenhouse gas is exchanged for another. But methane is about 15 times more potent than is CO2 in terms of heat absorption capability on a per-molecule basis, so the net effect is a functional increase in heat absorption by the atmosphere. Remember also that in most natural environments, around two-thirds of the methane is produced by aceticlastic methanogenesis (CH3COOH --> CH4 + CO2) - an even less welcome situation, as BOTH products are greenhouse gases. Even though methane concentrations in the atmosphere are two orders of magnitude below those of CO2, methane is thought to account for about 15% of the anthropogenic climate forcing, compared to about 60% from CO2. Most of the rest of the contribution is from nitrous oxide (N2O, a respiratory denitrification product that has something like 300 times the heat absorbing capacity as CO2) and the old chlorofluorocarbons (CFCs), even stronger heat absorbers yet, but more famous and dangerous as stratospheric ozone-depleters."